Finally cycled outside this weekend! Wanted to do another 26 today but was supposed to be back from a late lunch at about 5:30pm, not really leaving me enough time for that. So I hatched a cunning plan to do 20 or so, arriving back near the house at 5:30 when I would check my email, then if nothing needed my attention, I'd do another sneaky 6. Didn't really plan the route. I went out through Coalville and Whitwick to Belton, then across to the top end of Top Brand, back home the usual way from there via Peggs Green and Coleorton. Arrived near home after about 15 miles with a bit of time left, so I faffed around for another 5 miles or so then checked my Skype and email at 5:30, just near my garage. As things turned out an issue requiring my attention did arise right at that moment, so I had to curtail my cycling activity there and then and call it a day on 20.7 miles. Could have gone out after work instead, I suppose. Would have had more time but would have had to do the last 5 miles in the dark. Thought I saw some roadkill knickers coming through Coleorton, but I think it might have been a discarded sock. Not great weather at first - too blowy, especially for the first 15 miles or so. After that the sun came out, things warmed up a bit, and the wind faded away - or maybe I was just keeping pace with it. Anyway - that takes me to 77 this month and 739 this year. And today's ride was sufficient for a Veloforte 120km Spring Shakeout badge for my Strava Trophy Case. Not the most prestigious achievement perhaps, but nice to have. Looks like dry weather for a bit, but none too warm. Now that sunset is approaching 20:00 I have time to nip out for an evening ride once I've let my tea settle and wiped the pots. Been invited to join a local club who have started doing TT's, Crits and the odd road race. Only caveat, can you hold 21mph average for a 30 mile ride. Ouch! Did the residents wave their knickers at you from their bedroom windows as you rode past? Didn't manage to better my time up Slag Lane tonight, could only equal my third best, but I'd come from a different angle tonight. A change of approach to the Mur de Paxton Road let me set my best time of the year up there, although I doubt my aging legs will let me approach my all time best now. Had to work until 6, but hadn't been out on two wheels since Tuesday. So after downing tools, I mounted the X with the intention of doing a 26-ish mile Twycrosser. I hadn't actually planned the route. Down through Twycross to Sheepy as usual, then through Ratcliffe and Sibson. Decided to take Shenton Lane to Bosworth, partly because I thought it would be less of a climb than going via Gibbet Lane or Bosworth Lane. I suspect you're swerving a big hill by going through Shenton. Will check that later. As it turned out I did exactly the same route as about three weeks ago, when I last detoured through Shenton on an impulse. Dry, but a rather low temperature. Had to contend with a stiff, cold headwind for most of the last 14 miles. Bracing. Picked up a few spots of rain near Sibson as well. Shenton was very atmospheric at dusk. Dark for the last 5 miles or so. I used a head lamp, not as powerful as some of the handlebar-mounted lights I own but adequate, and much better for checking the bike computer in the dark, or looking down at the chain to see what gear you're in. Handy for putting the bike away in a dark garage as well. 27.17 miles, taking me to 104 this month. This month's target is 269 so I think that's decent progress 12 days in, especially as I was in Belgium last weekend. More on Sunday I hope. Only a few miles longer than last week and a couple of hundred more feet of climbing, but that's drained me. I think it was cycling back into a cold, stiff, easterly breeze. Mind you, on the way out I thought I was flying, thanks to it being a tail wind! It was another nice day for it and plenty of other cyclists were out, I did enjoy looking at the faces of those climbing uphill into the wind as I went down, but I dread to think what I looked like! I wanted to do 26 or so, but I ended up planning a 30 mile route through Sutton Bonington and back, same as I did two weeks ago. I reasoned that the relatively low elevation of this route, with long flat stretches, merited a few more miles. Quite a sunny day when I set off, so I took the Spesh. I also wanted to calibrate its new bike computer. I still haven't flipped the stem, but I seem to have got used to it and the lower bars were no trouble at all. Will probably leave it. Once again, cold. I wore warm clothing with two leg layers, and my hijab. It does a brilliant job of keeping ears warm, and keeping wind noise off my earphones. Had to contend with a stiff, chill headwind for the first half, going in a NE direction. But on the return half of course that disappeared, and I warmed up nicely. I did pick up a few spots of rain coming through the University campus, though. Had intended to go up to Ratcliffe on Soar, but on a whim I took a left to Kegworth instead. Not that interesting really but I don't think I'd been to that part of Kegworth. Anyway - I turned round at that point, and came back the same way. Annoyingly I forgot to start the Strava app when I set off, and only remembered after about .14 miles. I may upload a dummy .14 'prequel' track to Strava to keep it honest. I like my Strava stats to match my spreadsheet. Over the recorded track, my new bike computer registered 29.76 miles, whereas the Android Strava app (which is pretty accurate I think) registered 29.68. The bike computer is set to a circumference of 210cm, and my maths tells me that if I'd set it to 209, it would have registered 29.62 - which is only slightly more accurate, but I suppose I'll do that. Good enough either way really. But it's a shame you can't set it in millimetres, like the cheap Chinese one I have on the X. It is, as of today, one year since I buggered my knees while cycling, on a trip to Huntingdonshire, Cambridgeshire and back. In that time, including today, I've done 1950 miles - which is way below what I'd consider my usual yearly average, but I do think things are improving and I was pleased with the way my knees coped with today's 29.81. Even pushing relatively firmly up the climb through Thringstone didn't cause any trauma. For sure the exercises I got from the second physio have made the biggest difference. Anyhoo - that takes me to 796 this year. 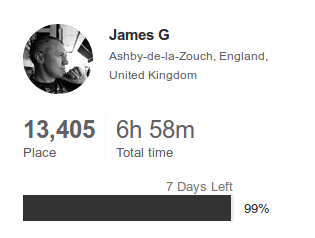 It also gets me my "British Cycling Ride Seven Challenge" badge, for doing 7 hrs riding between 8-21 April. In fact it looks like I've done 7 hrs exactly in that time, by coincidence - I honestly didn't contrive it. Nice. The weather is slated to warm up quite a bit this coming week, with 20 C forecast for Friday. Good times! Wish I'd taken it easier after yesterday's exertions, the legs felt powerless today, but the local flat roads are festooned with roadworks and traffic lights. I don't think the cold easterly wind helped much either. Because of the roadworks, I made only my second attempt in my modern cycling era of the Mur de Crow Lane - 0.22 miles @ 11% - slow going it was. Still, I made it, back in my teens on my 5 speed bike I used to get off and push, only ever doing one fully pedalled ascent, so a big Hurrah! for 22 speed bikes! I certainly did get my "British Cycling Ride Seven Challenge" badge, racking up 8h 17m, it's always a joy to get a free bit of tat! There was an article in today's M**l on S*nd*y about "Middle aged cyclist's knee" of which I'm sure Slim is familiar, it's caused by cycling only using three of the four thigh muscles and the hamstrings being underused which pulls the kneecap out of place. Over 50% off middle-aged cyclists suffer from it and they highlighted various exercises to ease it. Cheers Nick, I'll check that out. I'd love to think I'm middle-aged but let's be honest, not many people make it to 116. Or just get a professional bike fit from someone who knows what they are doing. You can read as many articles and theorize as much as you like, but in the end, everybody (literally) and bike and set up is different, and personal to yourself. I had one yesterday, few tweaks here and there, huge difference in comfort, and about 4% on power. Must admit I have been meaning to do that for quite a while. I doubt it'll be a silver bullet for knee pain, though. But it can only help. Anyway I normally have a day off for knee recovery these days, but prior engagements on Tuesday and Thursday night this week mandated a Mon - Wed - Fri cycling schedule. So barely 24 hours after dismounting from the Spesh yesterday, I was back on it. Set off with the intention of doing 26 or so. Because I dropped 0.14 miles yesterday by forgetting to start the Strava app, I had the bright idea of using my GPS-doping Soleus watch, to exaggerate the distance a bit and bring my Strava stats a bit closer to real life. It cheated quite a bit though and recorded 24.59 for a course that was really only about 24.11. Oh well! I'll put the real distance on the spready anyway. Went up toward Ashby and through Packington on the first part of the route, since I hadn't done that for months. Nice change. Passed a farm with a bird-shaped kite flying from a stick, presumably to scare off (real) birds. It also provided a graphic illustration of the direction of the wind over the second part of the ride; pretty much right in my face. I'd forgotten completely about the stem and the height of the bars and seemed to be quite comfortable, but later on my back started to ache and I had to stop and stretch my legs a couple of times. I will have to flip the stem. Unfortunately the second time I stopped, at the top of Heather Lane, my right knee was quite hurty when I set off again. Perhaps I should have had a day off after all. Hopefully it'll be OK by Wednesday. I've noticed that the most force I ever put through my right knee is when I set off and start pedalling with the right leg. So I've been trying to switch legs when setting off, but it's bloody hard! Reminded me of learning to ride my first bike when I was a kid. Much nicer weather than yesterday. Not a trace of rain, sunny and a fair bit warmer. But blowy. Anyway that's the British Cycling Ride Seven definitely done, and I'm 18 hours into the Gore Wear 24 in 24 challenge, which requires 24 hours of riding in 24 days. Seven days left so I rather think that one's in the bag as well. Strava's very liberal with its challenges recently.